Nevada sportsbooks won a record $301 million in 2018 from a record $5 billion in bets, per a release from the state's Gaming Control Board. The House always wins. Nevada sportsbooks won a record $301 million in 2018 from a record $5 billion in bets, per a release from the state's [Gaming Control Board](https://gaming.nv.gov/modules/showdocument.aspx?documentid=14325). The $301 million net win for the state's sportsbooks beat the previous record of $248.7 million, set last year. In other words, gamblers in Nevada bet more *and* lost more in 2018 than in any other year. Football remained king with a record $1.8 billion bet on college and professional markets. Unfortunately for bettors, the past fiscal year was the second-most lucrative football year for the books, via ESPN. __Cash it:__ [Play BetChicago's Super Bowl 53 contest to win $10,000](https://betchicago.chalkline.com/games/10k-big-game-blitz) Nevada sportsbooks also set records in basketball ($99.6 million) and baseball ($47.1 million) net winnings. <a href="https://twitter.com/DavidPurdum/status/1090992405300592647" class="embedly-card" data-card-width="100%" data-card-controls="0">Embedded content: https://twitter.com/DavidPurdum/status/1090992405300592647</a> Although Delaware, Mississippi, New Jersey, New Mexico, Rhode Island, Pennsylvania and West Virginia have joined Nevada is the legal sports betting market, the Silver State is projected to have a bigger handle for Super Bowl 53 than the other seven jurisdictions combined, [according to](https://www.vsin.com/legal-super-bowl-betting-could-double-to-more-than-300-million-with-additional-states-on-board-according-to-vsin-projections/) VSiN. 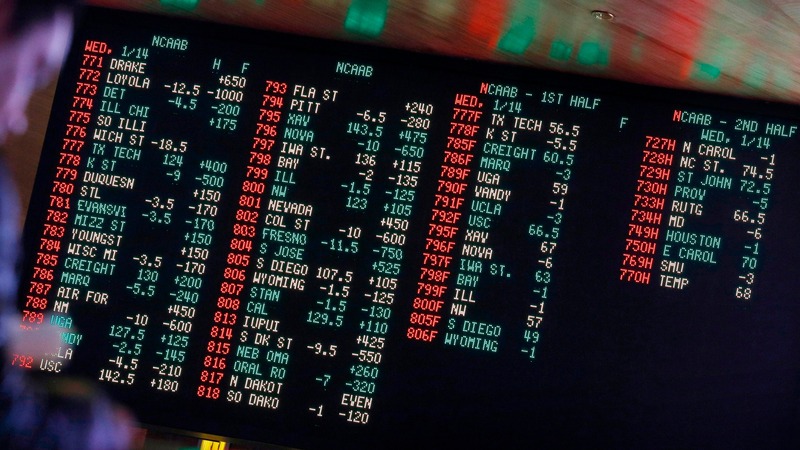 __MORE:__ [Vegas sharp bettors moving on several Super Bowl 53 prop bets](https://www.betchicago.com/super-bowl-53-prop-bets-las-vegas-sharp-bettors-rams-patriots) | [Referee trends could help bettors](https://www.betchicago.com/super-bowl-53-referee-john-parry-betting-results-ats-over-rams-patriots) Nevada is still king when it comes to sports betting, but New Jersey's sportsbooks took in $1.2 billion in bets the first six months they were open last year and are able to offer wagering options once reserved to offshore markets. If Nevada's outdated gaming regulations aren't changed to compete with other markets, some oddsmakers [warn](https://www.betchicago.com/super-bowl-53-betting-nevada-new-jersey-draftkings) it will have an adverse effect on the handle over time. Among all regulated games offered in Nevada, casinos statewide won $11.9 billion from gamblers in the 2018 fiscal year, via the [Las Vegas Review-Journal](https://www.reviewjournal.com/business/casinos-gaming/nevada-gaming-win-fell-just-shy-of-1b-benchmark-in-december-1586407/). The biggest net-winner? Penny slots at $3.3 billion. Go figure.